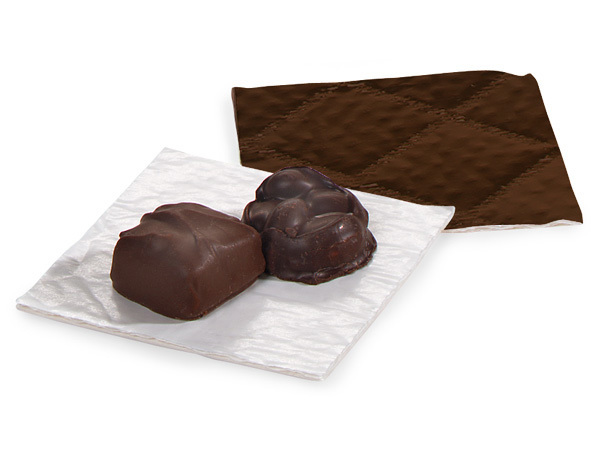 3-3/8x3-3/8" Chocolate Candy Pads with 3-ply quilted paper cushion are White on reverse side and can be used with our candy cups for easy, stackable layers in our gourmet boxes. Fits our Petite Gourmet Presentation Boxes, Small Folding Gourmet Boxes and our Jewelry Boxes in sizes 18, 20 & 21. Complies with FDA regulations for food packaging. Made in the USA. Pair with our candy tray for added stability for your candies. Candy Cups are made from brown glassine waxed paper which serves as an oil and moisture barrier. We have a small cup that is perfect for truffles, and a larger cup that is great for items like turtles or homemade peanut butter cups! Candy Pads are made from 3-ply white quilted paper cushion and will make stacking layers simple. These pads are stocked in several sizes to fit our most popular gourmet and candy boxes. Our pads are reversible and available in gold and white or chocolate and white. All of our candy cups and candy pads comply with FDA regulations for food packaging and are made in the USA.